Nano did not go well for me this year. I continued working on one of my projects that I’ve been working on for a while now. I really enjoy working on the story, but I did not enjoy Nano this year. That’s a tough admission for someone who has always loved writing, and, if I can say so, has always been pretty good at writing well in the face of a tough deadline. It wasn’t fun, though. I’ve been working on the same plot that I started a few years back, and, though I still love the story and the characters, I just couldn’t make myself write anything most days. It took me until about half way in to figure out what was wrong. I was forcing myself to write. I was forcing myself to do something, setting, honestly, unreachable goals for myself, and becoming more and more unhappy when I couldn’t meet those goals. Writing my story became just about as enjoyable as writing a twelve-page paper for a class that I hated. At least I had to do the paper. I started to dread the thought of coming home at the end of a (12 hour) day and trying to bang out almost 2,000 words every day. I started to resent my story and question everything that I had done up to that point. It got to the point that I considered scrapping the entire damn thing. To put that into perspective, this story is currently sitting at right around 97,000 words and about 300 pages in MS word. There are pages of back story work. There is a whole religious system, weather patterns, and season/crop cycles. I was working on a calendar! And I got so frustrated that I nearly scrapped the entire thing. But, thank God, I finally realized what I was doing. I was so focused on that magic number, on getting 50,000 words, that I forgot the entire point of NaNo, the entire point of writing for me. To do something that I enjoy. I write because I enjoy it and because I do it well. That’s… not what NaNo felt like this year. But, once I stopped focusing on my word count and started writing, just to write and not to meet a goal, I was so much happier again. Once I wasn’t thinking about how many words I was writing in a day, I was actually enjoying the words that I was writing again, however many there were, and that’s what matters to me. I want to finish this story, but I want to enjoy doing it. I’ve been working on my story off and on again, regularly, since NaNo ended last year, and while I haven’t done as much writing, I’ve gotten a lot of other work done on it. And I’ve had fun doing it. So, while I’ll probably do NaNo again this year, after 8 years, it’s become as much of a habit as anything, I’m not going to push myself as hard as I did this year. The point of NaNo is to have fun and write a story, not try so hard to meet a goal that you make yourself miserable in the process. Finally, here’s genuine congratulations to everyone who met their goal with NaNo16, whether it was getting down 50,000 words, or just making sure that you managed to write a few words every day. You did awesome, and you should be proud. Everyone who simply took on the challenge should be proud. Keep writing and have fun. 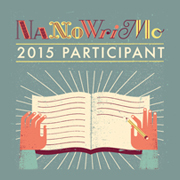 I’ve actually decided to attempt NaNo this year. I don’t know how it’s going to do, with six classes and a lot of writing due for each of those classes, plus working, but I’m going to attempt it. I haven’t decided what I’m actually going to work on. I might just start writing on projects that I’ve already started and just keep a running word count of what I add to them. There’s definitely some rewriting that I want to do on last year’s unfinished project “Ashes.” I’ve actually considered a complete rewrite, with changes to the core subject of the book. “Witch Queen” is still lurking in my head, waiting to be finished. Another project called “Shades in the Shadows” is unfinished, but it would take a lot of refining to be able to work on it and, even though I love the concept, I’m not sure I have the time to make it work. I even have a piece that I haven’t started on. I’ve just written the summary for it. I’m not even going to consider that one at this point. I just couldn’t stay away from Nano. After six years of participating, I just couldn’t not, especially after falling short of the goal last year. It’s all over my FB feed, and I just couldn’t help myself. If you want to find me on the NaNo site, here.